A Club Car battery is called a deep cycle battery if you own an electric golf cart. There are several different makes to choose from with Trojan and Exide manufacturers being the most popular. The best golf cart battery is going to be the one that has the right voltage for your cart and provides years of long lasting charges. All of the new electric Club Car golf carts use six 8 volt golf cart batteries. 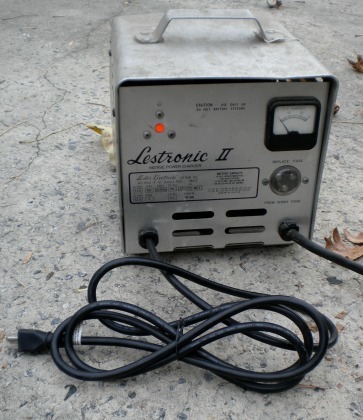 This provides a total of 48 volts. Other manufacturers use six 6v golf cart batteries or four 12 volt golf cart batteries. The older models like mine, which is a 1987 Club Car use a 6 volt golf cart battery. The golf cart battery box holds a battery pack of 6. 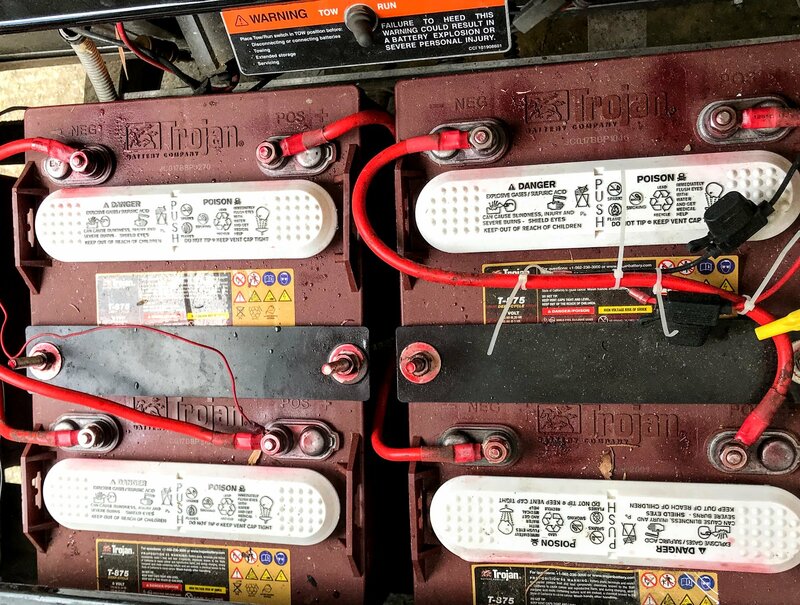 The combined voltage from each of the 6 batteries makes up the total golf cart voltage. This gives me a total golf cart voltage of 36. The power and longevity of the 6 volt battery has served me well these 15 years. Playing 36 holes of golf on one charge is no problem. Or using it to get across town. The total golf cart voltage of 36 provides plenty of power for going uphills and a long enough charge to get us any where we need to go. Of course it is important that the cart is fully charged and that the batteries are receiving regular golf cart battery maintenance. 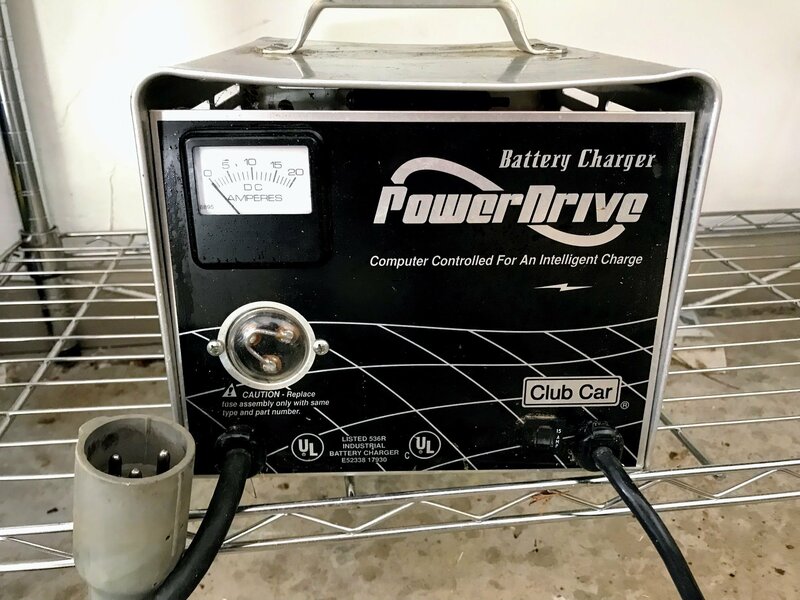 Is There A Specific Club Car Battery? There is no deep cycle battery that is a specific Club Car battery. Right now I have Exide deep cycle batteries in my Club Car. I've had them in the cart for 4 years and they've been very reliable and provide plenty of power and a long charge. Exide and Trojan are the two most common golf cart batteries. 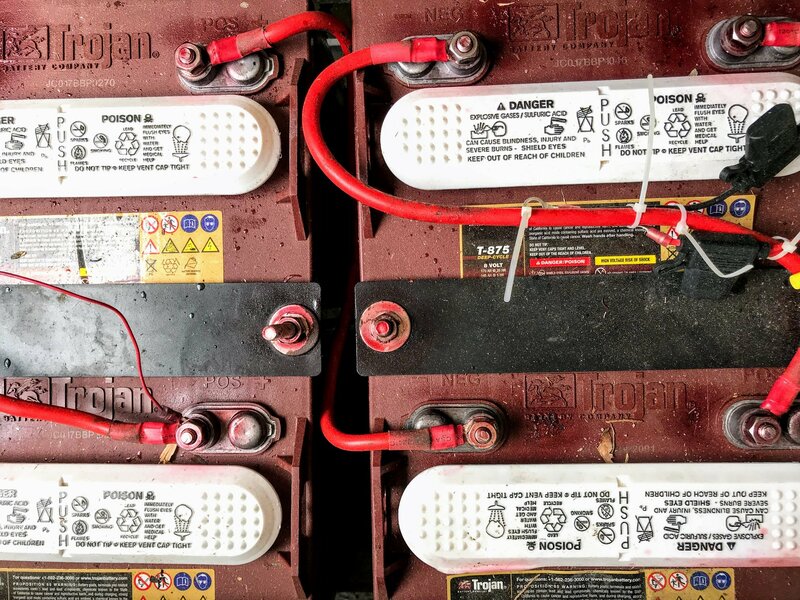 Trojan Golf Cart Batteries. This manufacturer of lead acid batteries is the battery of choice for many of the new electric golf carts. The key to golf cart battery longevity depends more on golf cart battery maintenance and correct battery charging than it does on the battery manufacturer. Prevent your club car batteries from rattling, shifting or moving with a battery hold down plates. This one is for Club Car DS models that use 12 volt batteries. It's about 15.75" long. Golf cart battery cables need to periodically be replaced. Eventually they will corrode or weaken which can compromise the integrity of your golf cart batteries. Most factory installed cables come as thinner 6 gauge while an upgraded cable will be a thicker 4 gauge. If your batteries are not charging or not charging completely it may or may not be your charger. If your batteries have completely discharged the battery charger will not turn on. 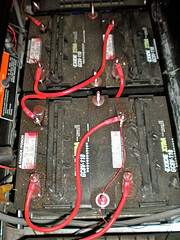 Often new golf cart owners believe the problem to be the golf cart charger - when in fact it's the depleted batteries. Most of the newer chargers require a small amount of charge in order to get the batteries up to a full charge. Our local golf cart dealers will test you golf cart charger for you to determine if the charger is the problem. It's usually cheaper to repair rather than replace. 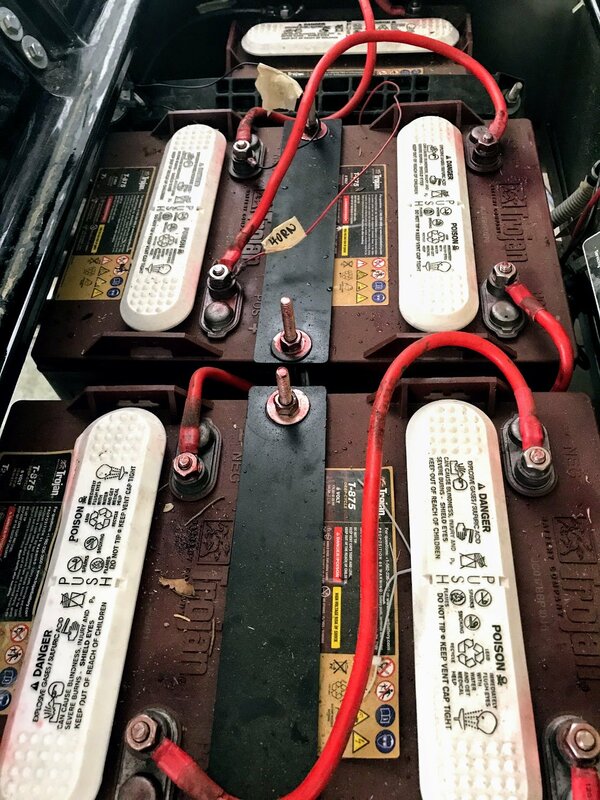 Correct golf cart battery charging is key to keeping your golf cart batteries healthy and around for a long time. 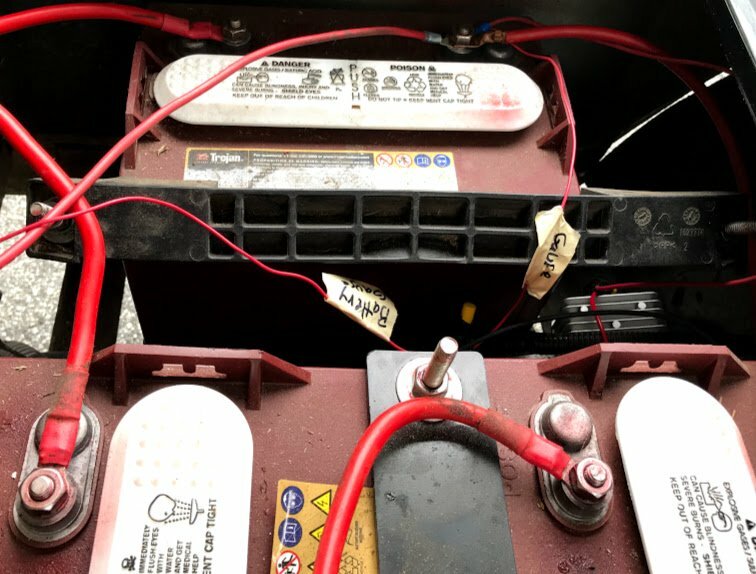 Now there really isn't much to learn about this - anyone, including you Leslie (that's my wife) can follow these easy to remember principles about charging a deep cycle battery. Learn how to keep your batteries around for many years and how to prevent a pre-mature deep cycle battery death. 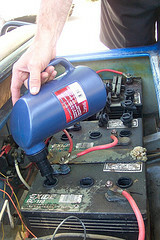 Providing regular golf cart battery maintenance can extend the life of your batteries. 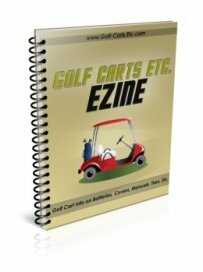 Many people who are new to Peachtree City or new to golf cart ownership, just keep driving their golf carts until one day it won't run any more. They failed to realize that golf carts do require some work - it's not much if you know what to do. Some preventative maintenance can save you hundreds of dollars. Here in Peachtree City many of the golf cart dealers do a nice job of performing regular check-ups if you'd rather not do this yourself.